En esta aportación se visibilizan los conocimientos y aprendizajes que deben conformar la Formación Investigadora en Tecnología Educativa, derivados de tres modelos formativos teóricos: técnico, personalista y cultural. Se aporta también un modelo teórico, validado empíricamente, para explicar los procesos internos que subyacen en la formación investigadora en Tecnología Educativa. Los procesos de formación investigadora se ilustran en base a historias de vida de investigadores que conforman un grupo de investigación consolidado en Tecnología Educativa. Se concluye expresando la necesidad de profundizar y avanzar en el conocimiento pedagógico de la formación investigadora. 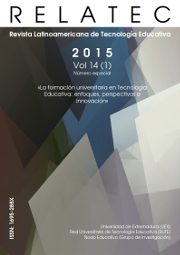 In this contribution, knowledge and learning that should shape the Research Training in Educational Technology become visible. This knowledge and learning derive from three theoretical training models: technical, personalistic and cultural. A theoretical model, which has been validated empirically, to explain the internal processes that underlie Research Training in Educational Technology is also provided. Research Training processes are illustrated based on the life stories of researchers who make up a research group in Educational Technology. It concludes by highlighting the need to advance and deepen the pedagogical knowledge that forms the Research Training. Colás-Bravo, P., González-Ramírez, T. & Conde-Jiménez, J. (2014). La formación investigadora (I). Modelos pedagógicos. Barcelona: Universitat de Barcelona. Dipòsit digital: http://hdl.handle.net/2445/53640. Convert, B. (2005). Europe and the Crisis in Scientific Vocations. European Journal of Education, 40(4), pp. 361-366. Convert, B. & Gugenheim, F. (2005). Scientific Vocations in Crisis in France: explanatory social developments and mechanisms. European Journal of Education, 40(4), pp. 417-431. Díaz-Barriga, F. & Hernández-Rojas, G. (2002). Estrategias docentes para un aprendizaje significativo: una interpretación constructivista. México: Ed. McGraw-Hill. Edwards, T. M., Smith, B. K., Watts, D. L., Germain-Aubrey, C. C., Roark, A. M., Bybee, S. M., Cox, C. E., Hamlin, H. J. & Guillette, L. J. (2011). Group-Advantaged Training of Research (GATOR): A Metamorphosis of Mentorship. BioScience, 61(4), pp. 301-311. Evans, L. (2008). Is educational research(ing) a profession? Examining issues of professional status, professionalism and developmentalism. Comunicación presentada en la Annual Conference of the Society for Research into Higher Education, Adelphi Hotel, Liverpool, 10 de Diciembre. Evans, L. (2012). Leadership for researcher development: What research leaders need to know and understand. Educational Management Administration & Leadership, 40(4), 423–435. De Pablos, J., Colás, P., Gonzalez, T. & Camacho, C. (2013). Teacher well-being and innovation with Information and Communication Technologies; proposal for a structural model.. Quality and Quantity, 47 (5), 2755-2767. Fernandez, M (2002). La formación de investigadores científicos en España. Madrid: Centro de Investigaciones Sociológicas. Huet, I., Baptista, A. V., Costa, N., Jenkins, A. & Abelha, M. (2009). Evaluation of Under graduate Students’ Involvement in Research Projects. The International Journal of Learning, 16(9), pp. 575-588. Luckie, D. B., Bellon, R. & Sweeder, R. D. (2012). The BRAID: Experiments in Stitching Together Disciplines at a Big Ten University. Journal of STEM Education, 13(2), 6-14. Monastersky, R. (2007). The Real Science Crisis: Bleak Prospects for Young Researchers. The Chronicle of Higher Education, 54(4), pp. 1. Önnerfors, A. (2007). From Scientific Apprentice to Multi-Skilled Knowledge Worker: Changes in Ph.D Education in the Nordic-Baltic Area. European Journal of Education, 42(3), pp. 321-333. Rojas-Betancur, H. M. (2009). Formar investigadores e investigadoras en la universidad: optimismo e indiferencia juvenil en temas científicos. Revista Latinoamericana de Ciencias Sociales, Niñez y Juventud, 7(2), pp. 1595-1618. Smagorinsky, P. (1995). The social construction of data: Methodological problems of investigating learning in the zone of proximal development. Review of Educational Research, 65(3), pp. 191-212. Tight, M. (2008). Higher education research as tribe, territory and/or community: a co-citation analysis. Higher Education, 55, 593–608. Ucar, S. & Demircioglu, T. (2011). Changes in Preservice Teacher Attitudes toward Astronomy within a Semester-Long Astronomy Instruction and Four-Year-Long Teacher Training Programme. Journal of Science Education and Technology, 20(1), pp.65-73. Wang, J. T. H., Schembri, M. A., Ramakrishna, M., Sagulenko, E. & Fuerst, J. A. (2012). Immersing Undergraduate Students in the Research Experience: A Practical Laboratory Module on Molecular Cloning of Microbial Genes. Biochemistry and Molecular Biology Education, 40(1), pp. 37-45.